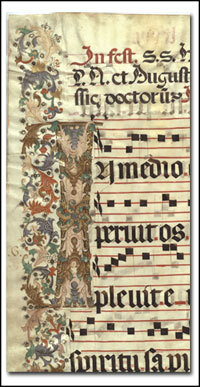 The Glaser Codex: A Manuscript of Liturgical Chant at M.I.T. The Glaser Codex comprises the remains of an approximately 107 folio (214 page) manuscript of chants for Masses for various saints (a Sanctorale). The hand-copied and decorated source is actually two manuscripts in one: an older hand (perhaps 15th century, Spanish) created the first version of the Glaser Codex. Later (perhaps in the 16th century) another scribe edited the first version of the codex, rearranging it, removing some chants, adding others, and changing the folio numbers (in red at the top of each "recto" or front side) of the pages and creating a new index. The older hand is distinguished by squarer letters while the newer hand uses rounder letters. Fifteen folios along with the original binding of the manuscript were donated to MIT by Constance Kantar in memory of her father Samuel Glaser who acquired the original source. These are currently part of the collection of the Lewis Music Library, under the provisional call number MS Lat. 2. Two more leaves were donated by Peter Orlov and Michael & Donna Moskow. More pages (at least sixteen, possibly many more) are in the private collections of many individuals; many of them have agreed to lend their holdings to MIT to be photographed or have provided us with photographs to place here. We thank Ms. Kantar and the other owners for their generosity. Special thanks are also owed to Steven D. Horsch of MIT Libraries, and Peter Munstedt and Christie Moore of the Lewis Music Library for their help in making this project a reality. And particular thanks to Nancy Carlson Schlock for her work on preserving and documenting both the donated and the loaned leaves. The manuscript arrived at MIT in September 2011. In Fall 2011, the students of 21m.220: Early Music, were the first to examine the MIT folios, writing about individual pages, determining the contents of the manuscript, raising questions to be solved, and presenting their findings here. Future installments of the class will examine sources not in MIT's holdings and attempt to reconstruct further this valuable manuscript testimony to the musical and sacred lives of a group of Spaniards from half a millennium ago.